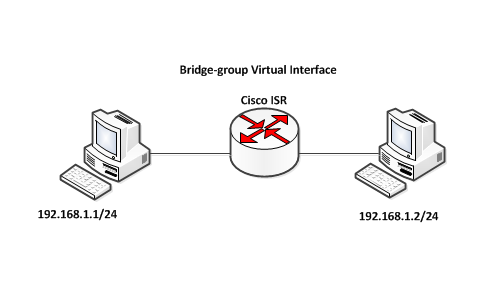 The objective of this lab is to bridge the two interfaces on the router and have the two connected PCs on the same subnet. We have learned that routers break up broadcast domains by default, this lab shows one of those scenarios where a router can be configured to not break up broadcast domains. One would think that implementing a solution like this should be relatively easy. Well, on a platform like the Mikrotiky RouterOS, it is. Thanks to its graphical guser interface. Can the same thing be said of the Cisco IOS? In this article, we will find out. From the network diagram below, we want to bundle the two interfaces on the router, connecting to the PCs, into one network and assign an IP to the bridge. To do this, we create a bridge and make the two interfaces members of that bridge, and then, assign an IP to that bridge. The given IP will be associated with all members of the bridge known as the Bridg-group Virtual Interface (BVI). Here is how it is down. For users running the Cisco ios on integrated services router, the commands below will guide you. For users on the XE platform designed for the Cisco ASR series, the commands below will suffice. Assign IP addresses from the same network to PC1 and PC2 and test. This lab was performed, using a Cisco integrated services router on gns3. That is how quick and easy it is to bridge ports on any Cisco router. ← How to stop external attacks on your Mikrotik router. How much will you sell timigate.com? Lol. Thanks but timigate.com is not for sale.